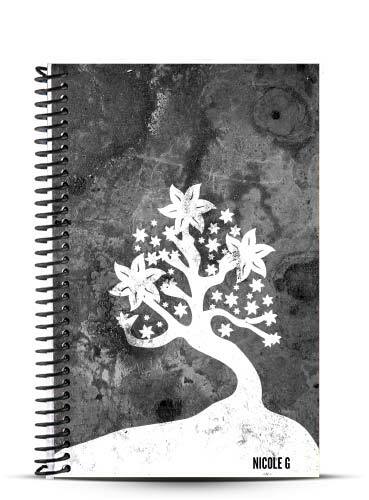 Our Personalized Journal Notebook allows you to adorn your journal notebook with the cover you’ve always wanted. Personalize your cover by picking your background, choosing your colors and uploading your artwork or images. 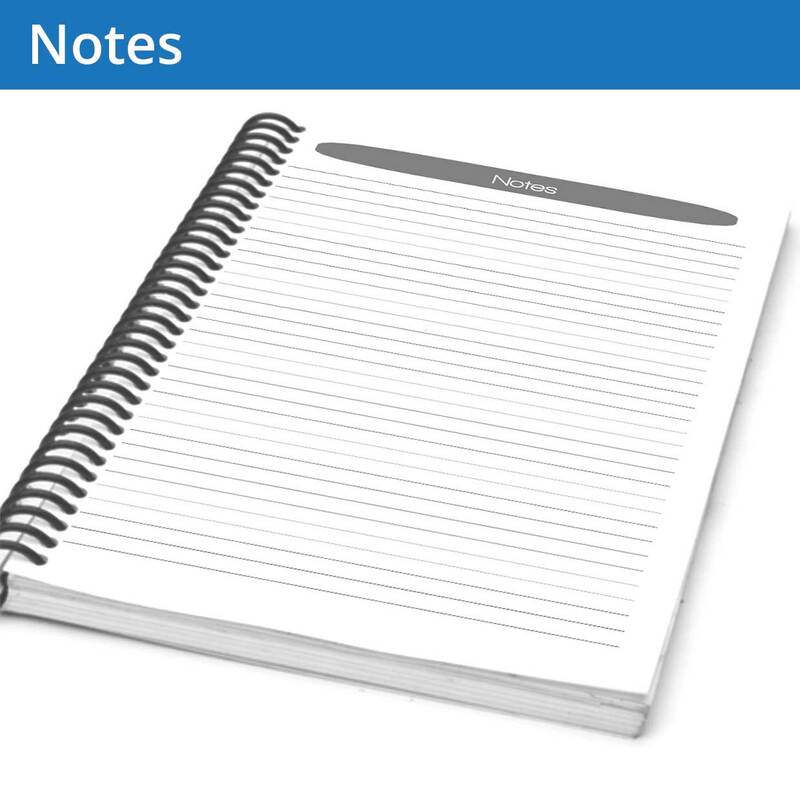 Then choose the page style of the notebook (blank, lined, lined grid or dot grid) so it can record everything you’ve ever desired. Would you like an emailed Digital Preview? The Personalized Journal Notebook is the perfect way to create a beautiful cover and add it to a blank or lined notebook. 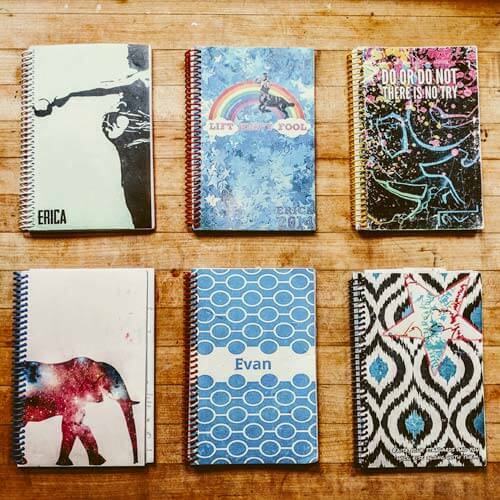 We print each personalized journal notebook cover on-demand when we receive your order and if you’d like to see a copy of your cover beforehand we’re more than happy to set that up for you, just make sure to select “digital proof” as you’re selecting your options. If you would like to change every part of your notebook please use the Build-a-Journal. We use a thick, 300 gsm, polymer paper cover paper that is flexible, rip-proof and waterproof to protect your thoughts, workouts, ideas, recipes and inspirations while brilliantly displaying your art and color. You can choose whatever you want to go on your personalized journal notebook and we will do our best to print it beautifully! We use a sustainably-sourced and low-waste process to prepare each page. We print on a 24/70 weight bright white, opaque sheet that you can’t see through, even if you’re writing hard (unless you’re using sharpies, no promises there). 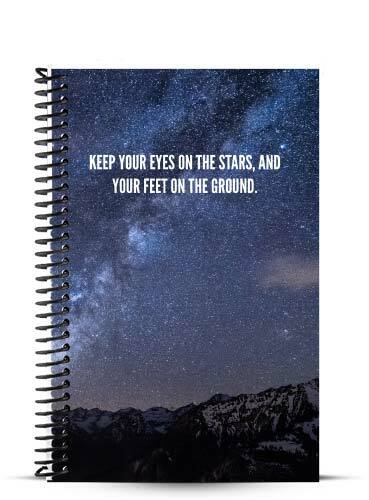 On each page of the personalized journal notebook is an inspiring quote or idea by some of history’s greatest writers and philosophers, there to motivate you to break out of the box and think in new ways. The personalized journal notebook is spiral-bound by a thick, flexible black plastic binding that molds to your purse, gym bag and pops back to straight once it’s in your hand. The spiral allows you to lay your personalized notebook flat or display just the page you’d like when you’re crammed for space. No bending of the spine necessary. Each journal notebook comes with 150 pages but you have the option to add up to 75 extra pages to your personalized journal notebook, allowing you to expand your notebook entries by up to 50% at a small additional charge. And if you’re like us, and absolutely have to write down ideas on whatever is nearby, we can add a see-through pocket to the personalized journal notebook so you can keep track of that new gym schedule, important post-it note or your next brilliant napkin idea!